I've probably said it before. Serendipity rules my life. I head out in the direction I think I need/want to go, and POOOFF! oooops. Course correction. Going over there instead. And you know, it all sorta works out. I'm amazed that most of the time, it works out for the better. This is the Empress Hotel, named after Queen Victoria. It celebrates its Centennial this year, and has been highlighted in Victoria Magazine and other magazines. 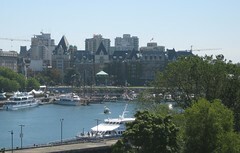 This was one of my big wishes for the trip- to pull our boat up to the Empress and have high tea. This is where we stayed instead - the Inn at Laurel Point. And I have to say, it's pretty spectacular. That picture above, that's the view from the front of our hotel. This is the view we had from our room. Can I just say I kinda like it? 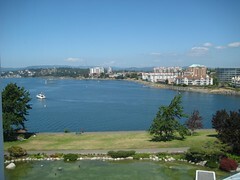 Tonight, we're staying at the Brentwood Bay Lodge and Spa, up closer to Sidney. It's a sweet little hotel, but I liked looking at the boats scurrying in and around Laurel Point. There were planes coming in to land, just yards away from kayakers and Sea-doos and cute little harbor ferries. There were buoys to keep everyone in their own lanes, and harbor patrol boats to herd any stragglers. Both the Roketman and I were a bit cranky today, struggling with Victoria parking (actually, the lack thereof) and traffic. I think we just didn't want to leave the Inn at Laurel Point. Tomorrow, we take the ferry back to Anacortes. I'm hoping to get dinner at the Microbrewery in Burlington, you remember the one that serves breakfast? Last time around they were closed for dinner on the Fourth. Then on Friday, we have a doctor's appointment to get the official prognosis for the Achilles tendon. (think good thoughts for me, ok?) We'll drive back to Seattle Friday afternoon, and fly home Saturday morning. I'm a bit wistful, can you tell?